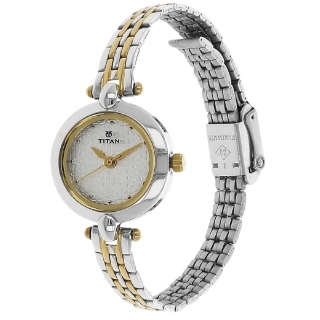 Titan Online Store Sale - Purchase Titan Karishma Analog Watch for Women at Rs.1975. This analog watch for women features a white and gold round dial, with patterned flowers, enclosed in a brass case that has a crown. Markings at regular intervals and plain three hands are present on the dial. Its strap, made of stainless steel is silver and gold in colour and comes with a special three piece sliding clasp. Also get free shipping in India. All products on Titan store are original and go through strict quality check. Shop now!